Recently I learned that Addgene’s pLKO.1 cloning protocol is viewed around 3,000 times each month. I looked this up after trying out the new protocols.io beta platform for sharing, annotating, and storing life science protocols. Since we began sharing this protocol on the Addgene website in December 2006, the pLKO.1-TRC cloning vector (deposited by David Root of the Broad Institute) has consistently been one of the repository’s most frequently requested plasmids. I wondered how many scientists have used the protocol for this plasmid, and if it still being used. After learning of it's continued popularity, I decided this protocol would be a worthy first contribution to the protocols.io community. Did I mention that this protocol is being used around the world? In the last month it’s been viewed by users in the US, China, India, Canada, the UK, South Korea, and beyond! So that’s great, but what if someone in China improved upon that protocol? How would the thousands of other scientists using pLKO.1 variants learn about those updates? This is a problem many scientists struggle with, even within their own lab. So what is the best way to share these improvements? You could publish a paper that happens to include your improvements, or maybe even a methods paper. The problem with this is that it may take months of time for your manuscript to get reviewed and edited prior to publication, and this will delay the dissemination of your improved protocol. If you’re working with plasmids and you decide to share them using Addgene’s repository, you can also share your associated protocols. When you upload your plasmid information, you’ll have the option to add additional documents. By uploading your protocols onto your plasmid page, scientists who request your plasmid will have easy access to your protocols when they begin their own experiments. Need to submit an updated protocol? Just email us at help@addgene.org and we will be happy to upload your newest resources. Here is an example of a plasmid with a downloadable protocol listed under “Supplemental Document”: gRNA_Cloning Vector (deposited by George Church’s lab). Addgene has also cataloged a variety of useful molecular cloning protocols, including making LB agar plates, restriction digest of plasmid DNA, and bacterial transformation. And more plasmid-related educational resources can be found in our Plasmids 101 blog series. Want to learn more about sharing your plasmids via Addgene? Check out all the benefits and how you can get started on our deposit page. Protocols.io is the creation of ZappyLabs. Currently in beta testing, the software aims to be a life science protocol repository. The software can be used with the ZappyLabs Bench Tools mobile app (available for iOS and Android). A neat feature of protocols.io is the checklist feature which allows you to check off steps in a protocol as you finish them, turn on pre-set timers for incubation steps, and save the entire process so you’ll have a record of your work. This feature further simplifies lab work if you like to bring your phone in the lab, though, honestly, this still grosses me out. Maybe it’s just me – I didn’t get a smart phone until after I had finished my PhD and left the lab for non-bench work – but is there a sterile, clean way to bring your phone into the lab? Maybe having a dedicated lab-use tablet? The software also makes it easy to annotate protocols, make them public for others to use, and add your own comments. Currently you can find protocols from NEB, OpenWetWare (see below), and now Addgene. I just began uploading our cloning protocols to the site and will keep you updated as I learn to use the resource. OpenWetWare.org (OWW) is a wiki that provides a community for biologists and bioengineers to share their educational materials, protocols, and courses, as well as a space for research labs to create their own lab or group websites. OWW is managed by BioBricks Foundation and is built on scientists adding and editing content. Here at Addgene we’ve been known to recommend protocols listed on OWW, including those for preparing your own competent cells. If you’re familiar with the process of creating and editing Wikipedia pages, OWW will be relatively easy for you to begin using. For the novice, the format does have a learning curve, but OWW walks you through the process with detailed tutorials and easy to copy and modify templates (e.g. http://openwetware.org/wiki/Protocols/Template). Nature Protocol Exchange (NPE) is an open online protocol repository hosted by the Nature Publishing Group. Like the previously mentioned sites, NPE allows scientists to join labs or groups and to upload protocols to share with others. The site allows you to comment on protocols and create lists of your favorite protocols for future reference. The exchange currently boasts over 2,500 protocols covering a variety of bio and biomedical topics. Protocol Online is one of the early protocol sharing websites. It was created in 1999 and allows scientists to contribute protocols or provide links to protocols on their own websites. We're not sure how frequently it's being updated now, but there are some classic protocols on Protocol Online that you might find useful for your research. Labguru is a good place to go if your lab is looking to streamline your lab management and you want the works: organizing reagent storage and inventory, managing orders, tracking students and research projects, electronic lab notebooks and protocol management. Though this is a subscription-based software, Labguru does offer free trials and pricing options for academic labs, departments, industry, and more to fit every lab's needs. Plus there are the apps - many to help you access your protocols at the bench, keep your inventory at your finger tips, and make shopping lists as you finish the last of a reagent. Though sharing your protocols is limited to within your lab group, Labguru does offer access to protcols from external vendors, such as Nature Protcols and NEB. Quartzy is a free web-based lab management tool that allows labs to create accounts in which their members can share protcols, sign-up for shared equipment, and track inventory and orders. Quartzy caters to life science labs and offers the service free of charge to scientists by allowing companies to pay publish their catalogs on the site. Like Labguru, Quartzy offers software designed with scientists workflow in mind and can offer a one-stop solution to your lab's organization and management needs. With Quartzy you can share protcols with your labmates, but the system does not appear to have a way to share your protocols with other groups. What Apps Do You Use to Improve Your Lab Productivity? As this is a growing market, I am sure I missed some of your favorite apps. If you know of a software app that I missed, let me know in the comments below and leave your thoughts on how the app works for your lab’s needs. At Addgene, we’ll continue to create new molecular biology educational resources, such as protocols, Plasmids 101 articles on various plasmid features, and reference tables (i.e. antibiotic concentrations, commonly used primers). We also encourage scientists to upload protocols when they deposit their plasmids to the repository. These protocols show up on the related plasmid pages and can help scientists use these plasmids more successfully. 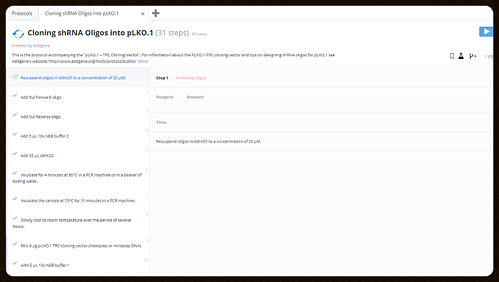 And I’ll continue to add some of our basic protocols to the protocols.io app so that all of our researchers can easily take those protocols to the lab bench with them and feel the satisfaction of checking off each step as you painstakingly complete your experiment – one small victory in a long road to your scientific breakthrough.